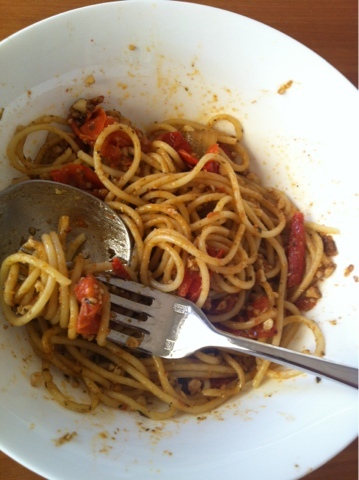 and this is what I cooked: Pasta cheat! Then I get home and realise that all my recent travel has meant that a) I have no alio b) I've killed my basil plants and c) I have not been shopping in ages and I have no fresh seafood. Like last night. Fortunately I had a full tub of Chunky Basil, Cashew and Parmesan dip (do you remember, back in the early noughties when these first started appearing on supermarket chiller shelves? What a godsend! ), a few squashy old mini-Roma tomatoes, half an onion from who-knows-when, some instant spaghetti (cooks in 8 minutes!) and my usual pantry staples. So I boiled up the pasta and at the same time drizzled olive oil & balsamic vinegar into a frying pan and blackened the tomatoes with a sprinkle of salt, pepper and powdered garlic. I then added the chopped onion and cooked through until translucent to get the flavour out of its sorry bones. I then smooshed the tomatoes hard with the back of the spoon. The basil dip tub was unceremoniously dumped into the pan and then the pasta was done so I mixed it all up in the frying pan to coat the strands and hey presto! Alio olio tomato pesto. Such a good idea to use that dip as pesto! I've used it on pizza, but that's about as inventive I've got with it.